With these top pregnancy and postnatal exercise classes, there’s no need for your fitness regime to take a hit when you fall pregnant. No matter your fitness level, exercise classes are a great way to keep fit, stay motivated and boost positivity. And that certainly doesn’t have to change when you’re pregnant or a new mum. In fact, attending pre or postnatal gym classes is a great way to meet other new or expectant parents. There’s also no denying the benefits to your physical and mental health – both of which can be tested during pregnancy and motherhood. It’s also claimed that exercising when pregnant can help reduce some symptoms and side-effects of pregnancy, including tiredness and nausea. Whether you’re a certified gym bunny with a bump or new to the fitness scene, there’s a heap of pregnancy and postnatal exercise classes out there to try. So grab your finest maternity gym clothes and test out our pick of the best. Exercising during pregnancy is widely recognised as being beneficial to both mother and baby, and the low-impact Barrecore Method aims to improve posture and maintain strength during pregnancy. Barrecore’s experienced instructors are able to adapt movements to the individual client to match their trimester and personal needs, helping to reduce pregnancy aches and pains and prepare the body for birth. The class is specifically tailored to help prepare your body for labour and all exercises are safe for baby. It’s the perfect mix of strengthening and stretching, all with good music to keep you motivated throughout. Pre-natal barre runs every other Saturday at the Wandsworth studio. 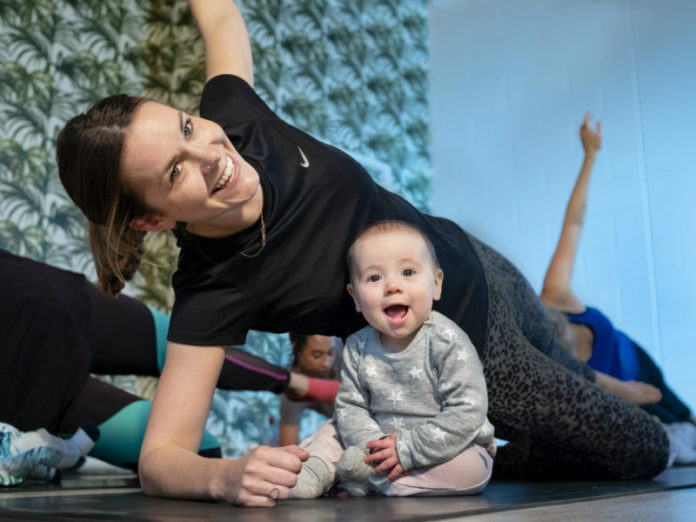 Frame founders Pip Black and Joan Murphy launched MumHood, their menu of tailored pre and postnatal exercises classes in a bid to help new and expectant mothers stay confident, strong and full of energy on their motherhood journey. 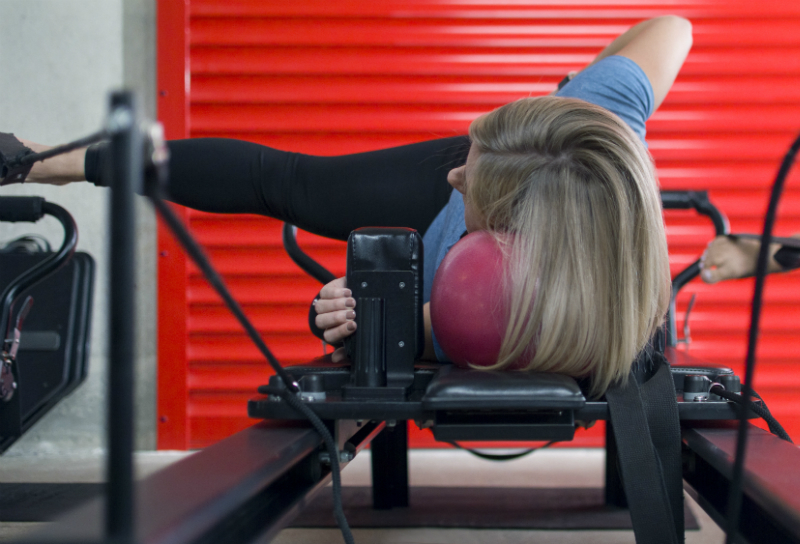 The Pre-Natal Reformer Pilates class helps retain muscle tone in your whole body and strengthen your pelvic floor. The control of Pilates and need to concentrate purely on your breathing and technique is also a great way to take time out during your pregnancy, all the while keeping your posture in check as your body starts to change. As well as pre-natal, Frame also offers up a number of postnatal classes. Core Rehab is a class for those just getting back into exercise post birth. It’s a great way to safely re-build your abdominal wall and focus on re-connecting the deeper core layers in a safe and comfortable environment. It conditions your body by lengthening and stretching the muscles that are over-worked during your day-to-day duties as a mum. 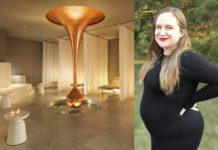 Yoga is a great way for expectant mothers to prepare for the birth experience, focussing on calming breathing techniques and preparing your body for labour. The movements and exercises can also help mums-to-be alleviate discomfort and strengthen the muscles in the body in preparation for labour. At triyoga, your yoga journey doesn’t have to end after birth. Postnatal yoga classes are a great way to heal, strengthen and nurture yourself without needing a babysitter. Plus, you can bring your little one along for some parent-baby bonding, too. Frame founders Pip Black and Joan Murphy share their expert opinion on exercising during pregnancy. Always consult your midwife or GP before starting. If you are generally healthy and have, so far, had a healthy pregnancy, you should be fine to continue exercising, but always check with your doctor first. If in doubt, a good reference point is the American Congress of Obstetricians and Gynecologists (ACOG) guidelines. Invest in a good quality sports bra. You don’t have to spend lots of money on a whole new sportswear wardrobe, but now is the time to invest in a good quality bra for working out. Nike and Shock Absorber are our go-to brands for hold-them-in, high-impact activities. Be sure to get measured, too – try John Lewis or Marks & Spencer next time you pop in! NOW READ: Check out our shopping guide to the best maternity sportswear. Don’t push yourself too hard in the first trimester. Your energy levels are likely to be low, so it’s important to bear this in mind. If you are feeling energetic, dancing, aerobics and body conditioning are all great classes to enjoy in the first part of your pregnancy. This is also a good time to do exercises on you back (such as hip raises) which may become more uncomfortable later down the line. Be careful when it comes to core work. Working your arms, legs, glutes and shoulders is absolutely fine – the area to be careful of is your abdominal muscles. Try to stay away from crunches, as you will be reducing the amount of space your baby has and increasing the chance of abdominal seperation. Working your obliques is fine, however, and will in fact help to support your growing baby and protect your lower back. Try to stick to a specialist pre-natal class as opposed to a standard Pilates class. You can still run during your second trimester. In fact, you’ll probably be feeling more energised than you did in your first trimester, but keep in mind that the hormone relaxin, which is present in your joints, will mean you are slightly less stable. Think about reducing your exercise intensity at this stage and take care not to increase your body temperature too much. Doing a spin class? Keep the cadence lower and the hills less steep. Slight sweating is fine, but make sure you are taking in extra water, too. Try non-weight-bearing exercises throughout your third trimester. You will now be feeling heavier and less agile, so try swimming, walking or specialist pregnancy yoga and conditioning – regular yoga will become tricky by this point and certain moves will need to be modified. It is fine to continue to exercise using weights if you want to, but listen to your body – if it doesn’t feel right, then stop. For advice on the best exercises to try out after giving birth, as well as postnatal fitness tips and tricks we consulted pre and postnatal fitness expert Shakira Akabusi. 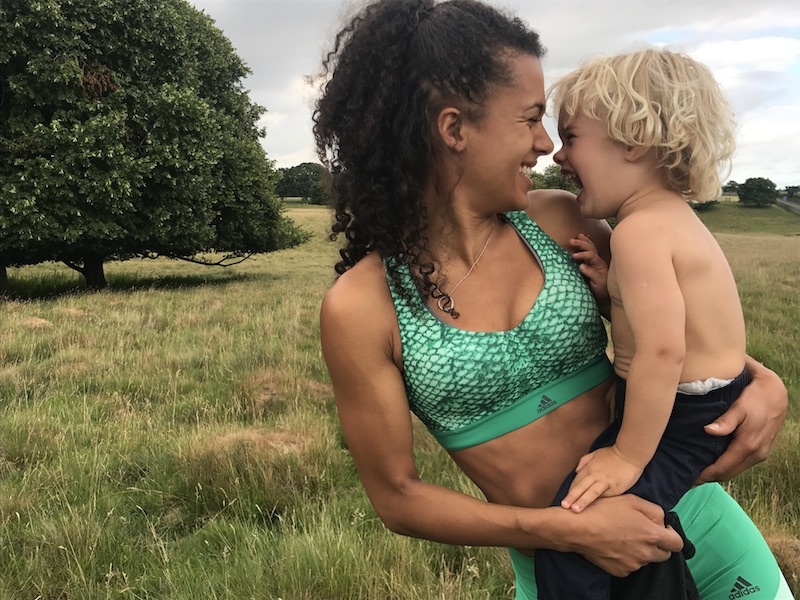 Here’s what the mum-of-two and founder of StrongLikeMum had to say. If you are a breastfeeding mother, take heart in knowing that to date there has been no evidence to suggest that exercise negatively affects breastmilk supply. Exercising to exhaustion may have a slight effect on the content of breast milk but this is short term and will be replenished within 90 minutes. It’s advised to wait until your 6/8-week check to engage in intense exercise, however the Royal College of Obstetricians and Gynaecologists (RCOG) recommends that “if pregnancy and delivery are uncomplicated, a mild exercise programme consisting of walking and pelvic floor exercises may begin immediately”. Your pelvic floor muscles run from your coccyx (at the back) up to your pubic bone (at the front) and form the base of your pelvis. Supporting your bladder and urethra alongside your spine and helping to control bowel and bladder functions. You may wish to begin working on your pelvic floor lying down and build up to a seated and finally standing position. Try to do this approximately 3-5 times a day for 5 minutes. Contrary to popular belief, the abdominal muscles themselves do not stretch as the bump grows during pregnancy. They are separated via a midline called the Linea Alba. For some, this will close quickly during the initial post-partum period. However, for a few, the gap may remain too wide, causing issues throughout their core support, often resulting in lower back ache and pelvic instability. A gap of more than two centimetres is considered excessive and may need further treatment. However, simple exercises such as pelvic floor work, and exercises that target the Tranverse Abdominis (deepest of your abdominal muscles), can help to repair this. During the initial postnatal period, traditional abdominal exercises such as crunches and sit-ups should be avoided. Instead try performing gentle moves such as beginners’ planks, functional pelvic floor exercises and the ‘Superman’ pose. Alternatively, begin with gentle heel raises by lying on your back on a hard surface. Bend your knees and place the soles of your feet on the floor. Inhale and, as you exhale, gently lift one heel off the floor, pushing your lower back down onto the surface, drawing your abdominals in. Hold for a few seconds then lower your leg back to the floor. Alternate between both legs and eventually progress to a double heel lift.